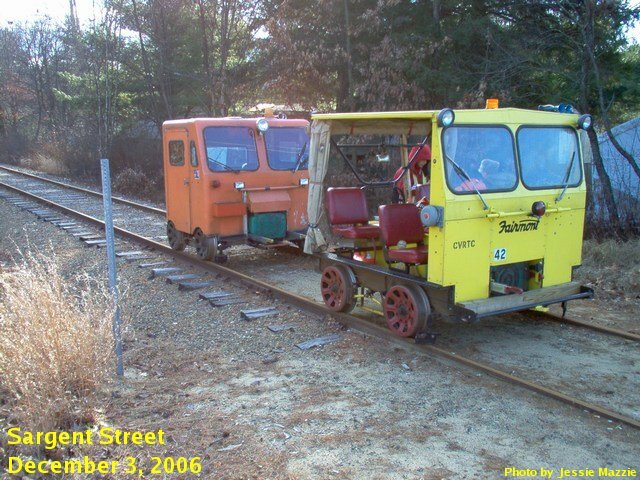 (October 28, 2006): Len submitted a picture taken during the October 14th excursion that CVRTC Member Art Hawkes set up on the former Maine Central Mountain Division. 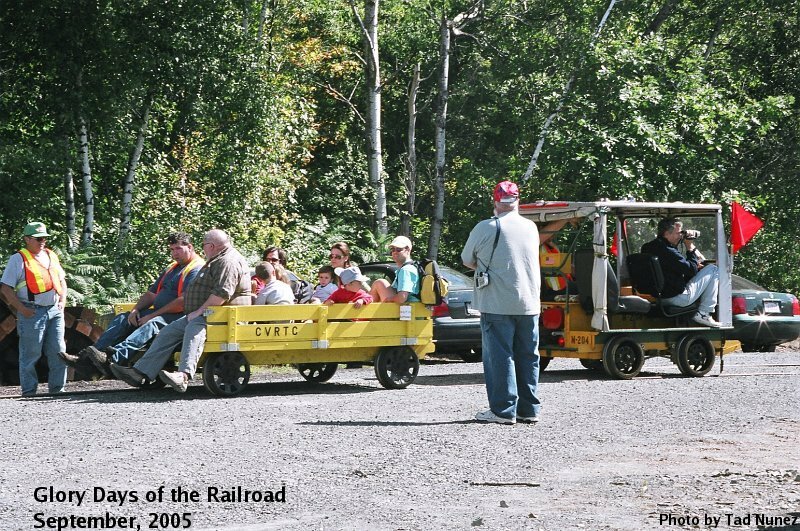 The picture was taken just south of the Rt5 crossing in Hiram Maine; site of small model railroad museum and restored caboose. Ed, the owner, is always accommodating to the group. 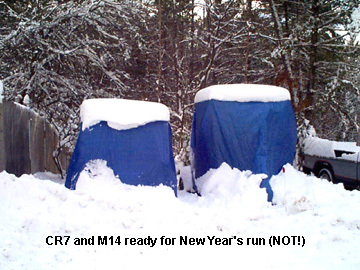 This track is owned by the State of Maine, and kept open by the efforts of Maine DOT, motorcar operators and snowmobile clubs. August 13, 2006: Very productive day. 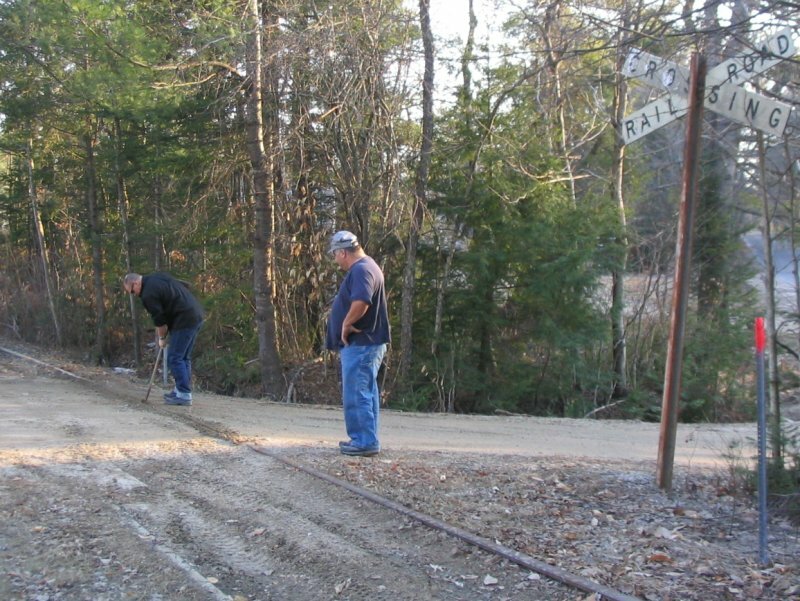 Prior to the meeting, several members brushed out the end-of-track at Wolfboro Falls, as far back as the first crossing. After the meeting, painting continued on the enginehouse; by the end of the day, the southern wall was nearly covered. A half dozen members took Harvey's new A car and the tractor east to solve some drainage problems. 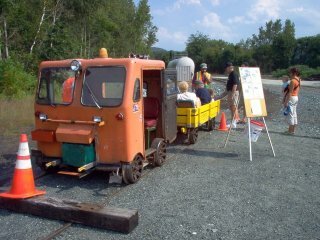 At Fernald, the tractor was loaded sideways onto the depressed center flatcar, and towed out to the blocked culverts east of "Moxie Junction". In the picture to the left, Harvey operates the back-hoe while the rest of us look on in amazement as the water level started dropping. The stone headers of the original railroad granite box culverts were 2-3 feet below the original water levels. Discussion at the meeting focused on the ongoing trail construction; TRAC's next meeting is this coming Thursday, and CVRTC Directors are urged to attend. Wayne reported that he is working on putting together a fall excursion for club members. Check back for updated information. 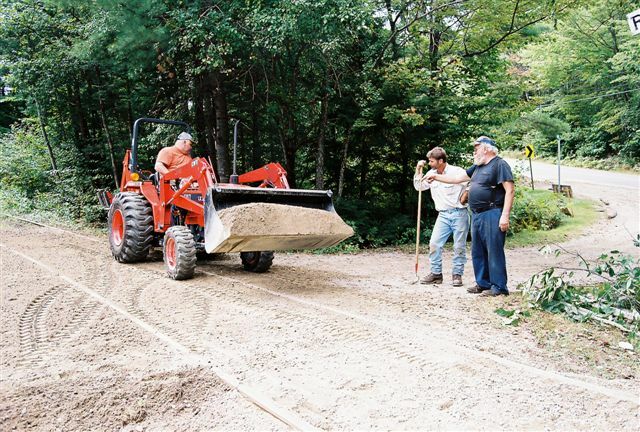 July 27, 2006: Harvey Simonds happened to run into the crew that is doing the work at Cotton Valley. They stated that the track crew has finished installing the ties and the tie inserter left today. There are still some spikes to be installed but that they may finish tomorrow or early next week. They still have a hi rail on the tracks in front of the station that is now blocking the trail contractor from loading his hi rail dump. 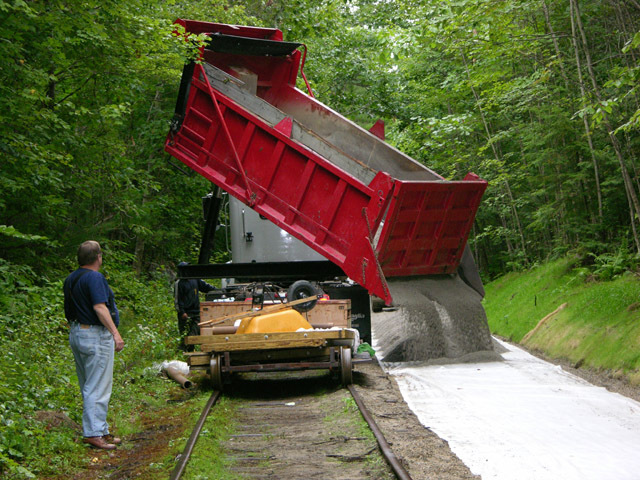 The trail contractor has agreed to park his hi rail dump truck near the NH-109 end of the enginehouse on the main when not in use. This should allow us to set on at the engine house and run towards Cotton Valley and if need be it also leaves the wooden pad available to set on to run towards Wolfboro. The trail contractor thought he would be there untill it snows. July 23, 2006: Bill and I set our cars on at the Concord Tower, and were joined by Roy and Peter. Form-D in hand, we headed north to MP-C12 to examine the Canterbury III washout. 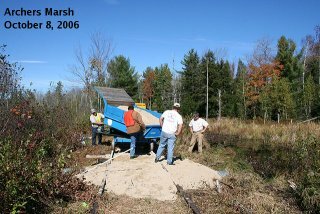 On the return trip, we cleared brush from the inside of the "Canterbury Curve", improving the sight line. Lunch was held at the overlook, as we watched several kayaks and a canoe floated by. After lunch, we returned to Concord; then headed up the Northern, clearing some small brush near the C&C junction and MP-N46. In the picture, Bill and Roy prepare to cut through a major blowdown at MP-N50. We patroled all the way to Penacook. July 20, 2006: Dave Kotsonis and The Thursday Group report that they continued their work on the Center Ossipee Switch. Dave continues, saying "We found a log between the rails and the switch open (switch stand not locked). We have no idea if this was done before or after the problem. We closed the switch and removed the log. We inspected the switch points and found nothing wrong with them. We did make some fine adjustments to the switch to make it easier to throw. To make sure we do not have any kids playing with the switch we have put a lock on it. The switch is set for the main. Our request for gravel to fill in around the switch can now be disregarded as we filled the area around the switch so you will not be underwater when you use it. We are going to make some more adjustments to the switch stand later next week. Just for your safety make sure you check the points and proceed with caution." June 18, 2006: How did you spend Fathers Day? Several Cotton Valley members spent "their day" riding the rails. 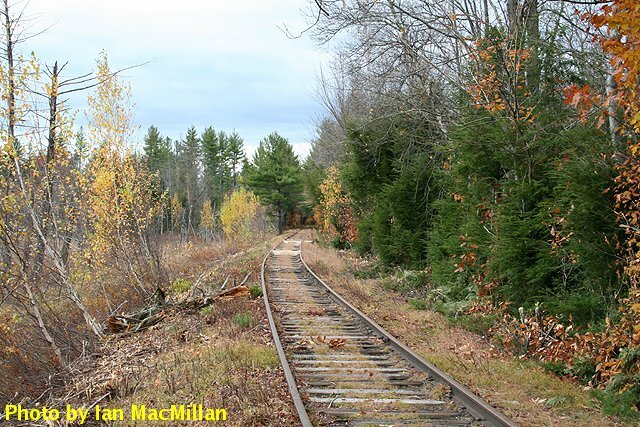 Jon Miner reports that he, his wife and kids got up to Fernald at 10am and started the day running the weed whacker, and clearing the area around the station and enginehouse, as far east as the mainline switch. While waiting for Harvey Simonds, they patroled east to Cotton Valley, reporting that no tie replacement has started yet, but many ties have been marked, and silt control fences are setup in some areas. Some new concrete bridge abutments have been poured just west of the Cotton Valley siding. Six bundles of ties have been delivered; thirty to a bundle. 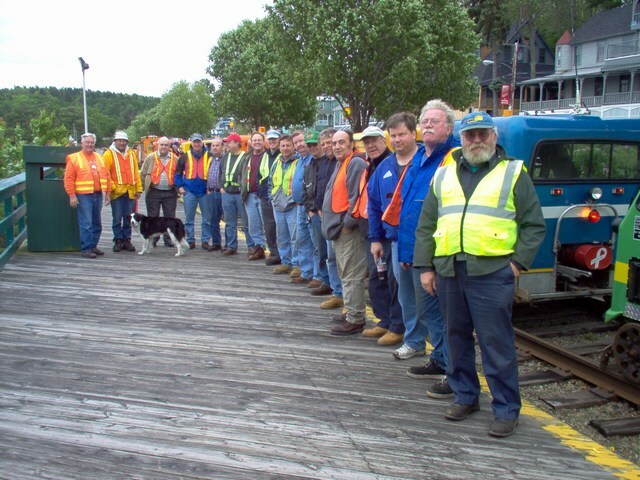 May 21, 2006: As mentioned elsewhere on this website, the tie replacement project will be starting soon, and should be completed the first week of June. If you are riding East from Fernald, be aware that there might be construction equipment on, or fouling the tracks. Current membership is at 83, and Roy will be sending out updated rosters soon; contact Roy promptly with any updates. Check the events page for upcoming events. Draft copy of the minutes has been uploaded to our Yahoo! Groups Site. 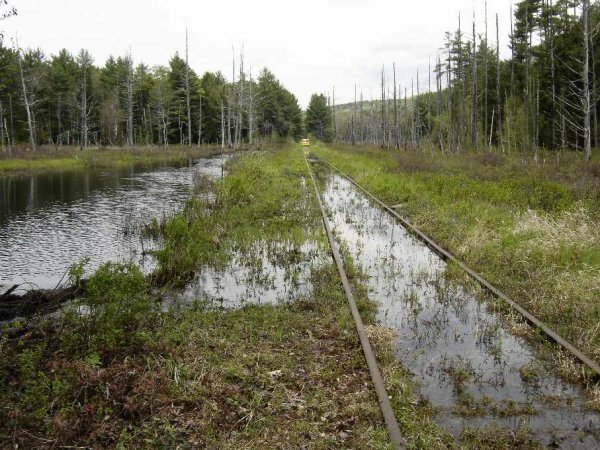 Art Hawkes reported that there is a problem with the rail at the sandpit crossing on the former Maine Central Mountain Division. This is seven miles east of the Whistle Stop store where we have set-on in the past. Art is going to contact Maine DOT and the sand pit owner, and try to come up with a solution for everyone. There will be a work party scheduled. If any members have a railroad claw bar, that would be very useful. Contact Art for more information, or to volunteer. May 17, 2006: It's been a wet week in New Hampshire. As a result of the heavy flooding, the Wakefield Pride Day has been postponed to June 3rd. This conflicts with the Hobo Run, but if you're available, see the Events page and give Bruce or Wes a call. It's a great chance to get out and promote the club. This weekend, Bruce wants to get some brush cleared and chipped. He's going to cut trees on Saturday, and start chipping at 8am on Sunday before our membership meeting. Give Bruce a call if you can help out. We cut up over two dozen trees that where over the tracks or very close to them. We started working towards Franklins and had no problem clearing the trees as I had my chain saw. After lunch I had to leave and the group headed for route 16. Half way home I get a cell phone call from the group. They ran into some very large trees that where over the tracks, and because I left, taking the only chain saw, the poor guys had to use two hand held saws to finish up the work. Anyways, the track and sidings are all clear. We still need to put the culvert in and fix the grade crossing at Franklins. As previous noted, the weather was great, and there were no breakdowns. If you can get away from work on a Thursday, get in touch and give the guys a helping hand to get this work done. See the archives for postings from 2003, 2004 and 2005. LEGAL NOTICE Operation of railway equipment, including motorcars, is governed by Federal, State and Railroad authorities. All rail property is owned by someone. Operation of any equipment on or around railroad property is only permitted with permission of the property owner or leasor. CVRTC will assist local, State, and Federal authorities in prosecuting illegal operators of railway equipment. 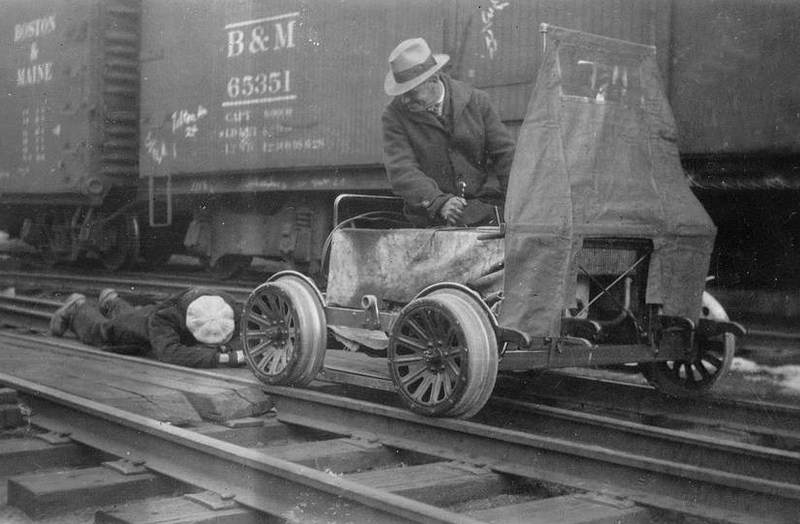 Railway motorcar organizations now exist in most parts of the world. Please contact one of your local organizations. 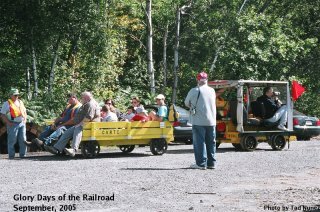 They have access to rail property, equipment information and SAFETY information. They are always looking to promote the hobby/sport and would love to have your help.